Spend R450 or more and WIN BIG! Imagine being rewarded for spending money!! Well that is why visiting Gauteng’s premier entertainment destination from 8 August till 31 October 2016 just got a whole lot better! 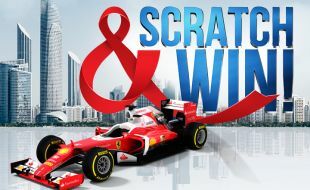 Spend R 450 or more at ANY participating Montecasino outlet and receive a scratch card with a GUARANTEED reward PLUS an entry to stand a chance of winning an amazing trip to Southern Sun Abu Dhabi & Ferrari World valued at over R 50,000! With over 45 000 guaranteed rewards up for grabs such as instant discounts, buy one get one free, free parking to free meals, casino FreePlay and much more - Montecasino will be more than just a destination for fulfilling your entertainment needs – but one that rewards you too! What is the main prize exactly? A 7-night stay to Southern Sun Abu Dhabi including breakfast, flights and a trip to Ferrari World.